Home office design has always been an important topic when we talk about remodeling a house, because it’s the space where we work. If we think that the nature of employment has change a lot lately and probably will continue to modify, more and more people are taking advantage of opportunities to work from home. Whether we are our own employer or we have the option of working at home, it’s essential that the workspace combine practicality and creativity in order to motivate us, encourage us and help us stay organized too. It’s not quite easy to find the right place and incorporate it into the home environment, but of course it isn’t something impossible and boring, if we have a good plan, some creativity flair and keep in mind some important aspects. Home offices just like corporate ones should embrace dynamic and inviting concepts that increase productivity, inspire and stimulate to have better professional results, be more happy during your working hours, as well as reflect our taste and personality or even our domain identity. 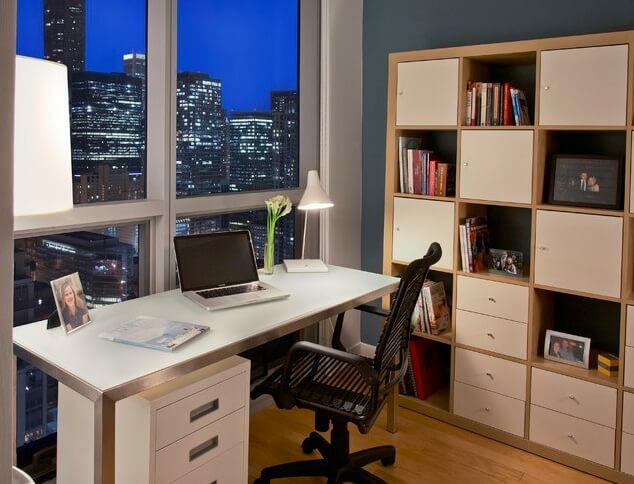 Here are some basic tips to set up a more productive and enjoyable home office. 1. We don’t want our office to be that unfriendly place where one stays because it has to, not because of the pleasure of working. Thus, a workspace needs definitely special attention to every detail in order to be comfortable and versatile, and feels more like home rather than an office. Functionality is the first thing to consider no matter how large or small is our room dedicated to such a space, but isn’t enough. These days, a succesful home office design comes from the smart combination between functionality and great aesthetic, the appearance and style of furnishings, decorations, accessories being extremely important. 2. To have the stuff organized, the basic things you’ll need is a desk, an great office chair, interesting filing cabinet, bookshelfs and a white board. Starting from here, you’re free to add whatever you feel it’s necessary for your work to be carried out as you want. But before purchasing any of this item, think about the style you like to achieve for your home office environment and then, it will be much easier to find the things you want with a clear picture in mind. In this way you’ll save time and you won’t get lost among searching for unimportant things that don’t match your tastes. 3. The desk must suit your needs, offering adequate storate and surface space. Depending on the nature of your work, there are many types of designs- L-shaped, U-shaped, etc., with or without drawers that doubles as a filing cabinet. In a similar style to the desk, buy a comfortable office chair. It’s vital to put health benefits above any others, when choosing it, knowing that negative consequences can arise. The most important aspects to consider: healthful back support, organic shapes and curves, armrest, adjustable height, easy movement. If you have the financial possibility, look for those type of chairs with the latest technology and materials, which automatically adapt to your spinal curves, postures and body shape. You’ll enjoy their benefits after a busy work day at computer. 4. If you are luckly to have a large working space, then you can opt for an additional filing cabinet or bookshelves to hold your files, documents and materials, or other things you love, things that inspire or motivate you. Besides its storage purpose, the top of a filing cabinet for example can be used as a table top for pictures and plants. Regarding the whiteboard, you don’t have to purchase one if you don’t really need. But it’s very good when you need to write something on and it helps you not to clutter up the office with paper, because it can be utilized again and again. Another inventive idea to keep your desk withou papers and easy-to-lose Post-its, consider adding a hand bulletin board to keep important papers and quick ideas. Graphics, photographs, colorful pictures and diplomas will personalize the office space, giving it an original look. No matter what and how many furniture and decorations item you want to have, they must complement each other so that the room is harmonic and allows you to move freely. 5. One of the most important step in the design process are colors. They are not just something that make your office environment look amazing, but they have a real impact on our mood, so search for colors’ features before using them. Light brown, neutrals, purple which stimulate creativity, orange which is associated with enthusiasm seems to be right for this kind of room. 6. Let in the light. Lighting is a very important feature and should not be neglected. Your home office space should have plenty of natural light during the day, so be sure to have large windows and if possible, move your desk close to them. Make sure to have a mix of adequate taks lighting directly above the desk and ambient light for moments when you want a softer and calmer one. Hi. In your second photograph theres lights on the shelves themselves. Can you please provide more information about that? Is that a particular shelf-type or can the lights themselves be found somewhere?